This course is the online component to the 50-hr Foundations Module offered by the Summers School of Yin Yoga. NOTE: You get free 90-day access to this online course when you enroll in any 50-hr Yin Yoga Teacher Training Foundations Module offered by the Summers School of Yin Yoga. Upon registration, you'll receive a link that grants you 90-day free access to the online course (a $125 value). Please note: You will need to complete the online course, including a short quiz, before attending the live teacher training module. Estimated time to complete the online course: 5-7 hrs. You don't need to be enrolled in Summers School of Yin Yoga in order to take this online course. It is designed to be a self-contained introduction to the concepts and practice of Yin Yoga. It can be taken on its own, giving you a low-risk opportunity to see if this module (or the school) is the right fit for you. Practice: Posture Practice with Tension and Compression Analysis; Full Sequence Practice - Playing, Observing Sensing. Below is a complete list of all the course lessons. Each lesson contains a video – and throughout the course, you’ll find worksheets and other downloads. Lesson 1: Yin Yoga 101: What is Yin Yoga? Required text (for the live component): Your Body, Your Yoga by Bernie Clark. It's not necessary to read this before the training, but this will serve as your ongoing reference book. Here's what past students have said about this module. 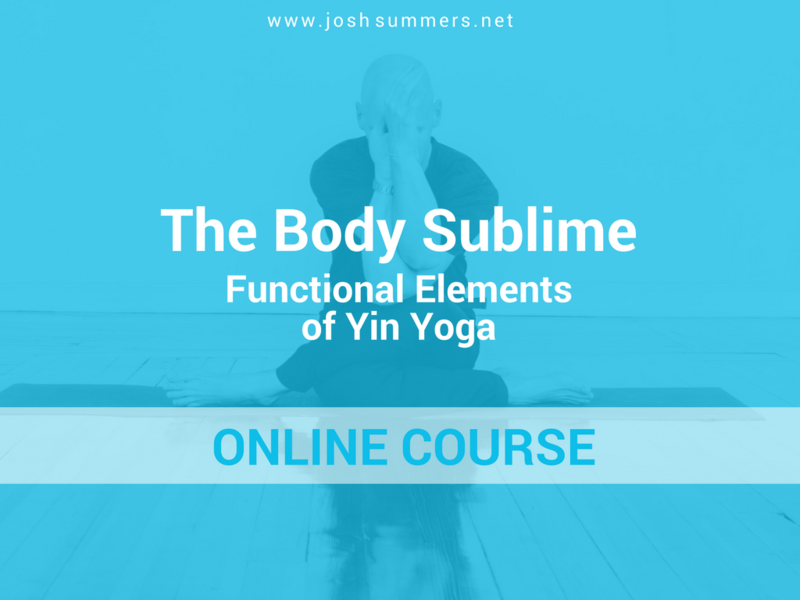 "The Body Sublime: Functional Elements of Yin Yoga" suggests a comprehensive overview of the practice – and it delivers. Naturally, the course begins with a working definition of Yin Yoga and then advances through some pretty interesting stuff – Connective Tissue, Fascia, Fibroblasts, Extracellular Matrix, Collagen, GAGS, and more. Best of all, Josh (with a demo by Terry), gives us not one – but two solid practices! The Posture Practice is all about the exploration of what we feel and the identification of tension and/or compression. This segment of the course requires a little soul and body searching but is worth the time and effort. The Sequence Practice is rich with take-homes, especially in the "Playing, Observing, Sensing" section. Bottom line – this is not a required study to hurry through and pass the test – but to chew on a bit, take time to digest, and then move forward better-nourished than before.